The American chestnut was the most important food and timber trees species in the Eastern hardwood forest. It was almost completely destroyed by a bark fungus accidentally introduced from the Orient in 1904. Within 40 years, over 30 million acres of chestnut trees were killed from Maine to Georgia and west to the Mississippi. This tragedy was the largest ecological disasters in American history. The chestnut was an amazingly useful tree: its plentiful nuts were eaten by people and wildlife, its beautiful, rot-resistant lumber was used for everything from furniture to fence posts, and its tannin used in the tanning industry. The loss of the chestnut, at the time of the Great Depression, had a devastating effect on the people and wildlife of the Appalachian mountains. The economic loss from the chestnut's demise amounted to untold millions of dollars. In the early 1950s, James Carpentar of Salem, Ohio, discovered a large living American chestnut in a grove of dead and dying trees. A member of the Northern Nut Growers Association, Carpentar was very impressed with the tree as it showed no evidence of blight infection. Over the next several years, he inoculated the tree with active blight spores and mycelia, but failed to induce any infection in the tree. Carpentar sent budwood to Dr. Robert T. Dunstan, a fellow member of NNGA and well-known plant breeder in Greensboro, N.C. Dunstan grafted the scions onto chestnut rootstock and the trees grew well. He cross-pollinated one with a mixture of 3 superior USDA released Chinese chestnut selections: "Kuling, " "Meiling," and "Nanking." In 1962, seedling trees from the first cross began to bear. Selecting the individual with the most hybrid characteristics, Dr. Dunstan crossed it back to the American and Chinese parent trees. The resulting second generation was moved to Alachua in north central Florida, on our nursery property, where the trees have been growing and bearing every year for almost 50 years! In 1984 we planted a second grove of 500 trees using both grafts and seedling Dunstans, and many are now over 50' tall and 12-16" in diameter. These Dunstan Chestnuts show a combination of American and Chinese traits. They are healthy, vigorous, and bear heavily every year. A third generation of trees was bred by crossing the trees that bore the greatest quantity of largest and sweetest nuts. We have chosen several cultivars as having the very best combination of nut and tree characteristics. The Dunstan Chestnuts are the first chestnuts to ever receive U.S. Plant Patents. The blight-resistant (not immune) Dunstan Chestnuts make possible the re-establishment of chestnut trees and chestnut orchards in America. Chestnuts are a delicious and healthy food! They are high in carbohydrates (40%), and very low in fat (2-3%), while other nuts are over 50% fat. Nutritionally, chestnuts are like a "grain that grows on a tree" and similar to wheat and brown rice. Chestnuts contain 5-10% high quality protein, and no cholesterol. Low fat, high carbohydrate diets are recommended by the American Heart and Cancer Associations. Chestnuts are excellent roasted or steamed (cut an "X" in the point of the nut so the shell splits easily) for 10-15 minutes. Chestnut dressing with turkey is a holiday tradition, and are wonderful in soups, stews, and with vegetables, or in desserts such as pastries, tortes and ice cream. Chestnut flour adds a rich, sweet flavor in cakes, breads, and pasta. Chestnut puree, blended with butter and whipping cream, can be spiced and used with main dishes, or sweetened with honey and topped with sweet whipped cream for the traditional European dessert, "Mont Blanc." The U.S. is the only country in the world that can grow chestnuts that does not have a large commercial chestnut industry. The U.S. imports $20 million of chestnuts yearly because there are fewer than 2500 acres of chestnut orchards in the U.S. It would take 10,000 acres of producing chestnut orchards to supply what we import! American-grown nuts can reach the market sooner, fresher, and bring a higher price than imports, which are often low in quality. U.S. consumption is less than 1 ounce per person per year, but 1 pound per capita in Europe and 2 pounds in Asia. It would take 120,000 acres of chestnut orchards to supply U.S. consumption at European levels, and create a $300 million new agricultural industry for America! Growers who produce high quality chestnuts in America will have a virtually unlimited market available to them for many years to come. Chestnuts are a very profitable crop. They bear in 3-5 years, and produce 2,000-4,000 lbs/acre each year at maturity (15-20 years). Wholesale prices for large, high quality chestnuts are $3.00-5.00/lb, and higher for retail. This is a superior return to pecans, hazelnuts and many other tree crops! Dunstan Chestnuts have been tested for resistance by inoculation with blight. No significant canker formation was observed for 4 years. Limited growth of the blight cankers was seen on only a few trees and in most cases, the inoculation wound healed completely. Reports from growers at over 2,000 locations around the U.S., from New England to Michigan, south to Florida and Texas, and the Pacific Coast have shown that the Dunstan Chestnuts have excellent survival, growth, and nut production in a variety of climates, from Zones 5-9. "We planted Dunstan Chestnuts on our farm in Illinois in 1999. They have grown tremendously, even in this cold climate. We sell everything we can grow, because of the quality of the Dunstan nuts!" Many chestnuts sold in the U.S. are not blight resistant, such as seedling American chestnuts, or European x Japanese hybrids. Blight resistance is extremely important, even in areas that currently do not have blight. Accidental outbreak can destroy susceptible trees. In blighted areas (most of the U.S.) only blight-resistant trees will produce. 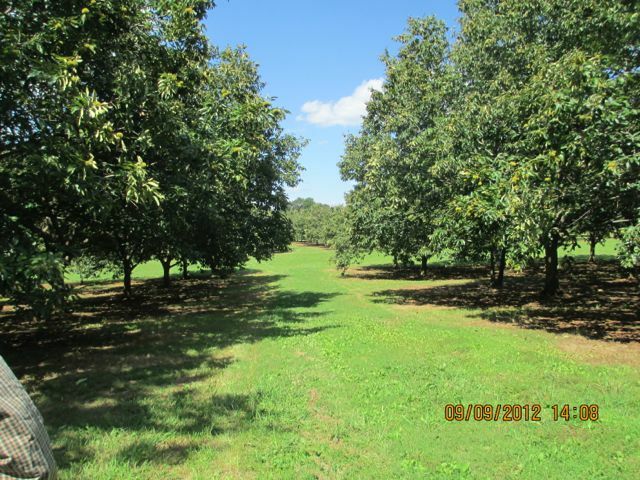 "We planted 62 Dunstan Chestnuts in 2000, along with 800 Collosal, Marigoule and Maraval chestnuts at our farm in northern Connecticut. We are surrounded by American chestnuts in the nearby forests, both dead trees and suckers resprouting from the roots, so there is a lot o f blight. All 800 of the other chestnuts have died, but we have not lost a single Dunstan Chestnut. This year (2010) we harvested 400 lbs of nuts from the 62 Dunstan trees. They produce beautiful, mostly large nuts." THE BEST CHESTNUTS ON THE MARKET! Dunstan Chestnuts produce heavy yearly crops of very large and sweet-tasting nuts. The nuts average 15-35 nuts/lb, as compared to Chinese nuts (35-100/lb) and American nuts (75-150/lb). They are much better tasting than imported European nuts, and are never bland or bitter. The nuts peel easily, unlike imports that have clinging and ingrown pellicles (seed coats). The nuts ripen in September and October, and most fall free from the burrs for easy harvesting. Dunstan Chestnuts grow rapidly and have an upright growth form, with spreading branches, similar to the American chestnut and unlike the smaller, more spreading Chinese form. These trees are long-lived, can grow up to 100' tall, and have timber value at maturity comparable to walnuts. Chestnuts are excellent for reforestation. Chestnuts are one of the very best trees for wildlife. Their consistent yearly crop of nuts (unlike oaks and other nuts that cycle between heavy and light years) provides food for deer, turkey, squirrel, bear and many other game and non-game species. Dunstan Chestnuts have large, beautiful, lustrous green, dentate leaves, and showy cream-colored blossoms. They make a picturesque ornamental as well as an edible landscape tree for backyards and homesteads. Some chestnut growers lease their farms for deer hunting in the fall. One grower reports income of over $1500.00 week leasing their grove to hunters. The big bucks love chestnuts! Item #: Dunstan Chestnut Tree Seedlings - The best and most widely planted variety of chestnut in America, also providing heavy crops for deer and wildlife.